Kaş is everything that a typical Mediterranean seaside resort in Turkey should be. White-washed houses cascade down the winding mountain roads to show the way to beautiful beaches and a harbor that reminds you that life is in fact quite good. While in Kaş, the best thing to do is to adapt quickly to the Mediterranean lifestyle. Like many towns in this area, there used to be a huge Greek population until 1923 when there was an exchange of citizens between Greece and Turkey. Many of the houses in Kaş are surrounded with pink bougainvillea flowers that immediately make you notice the influence of Greek architecture in some of the older properties, typically the wooden shutters, narrow streets and large terraces for enjoying the mid-day sun. Kaş itself is a quiet, pleasant town with its blue sea and narrow streets scented with jasmine flowers. There are plenty of little guest houses, quiet cafes serving home cooking or small bars in which to relax. 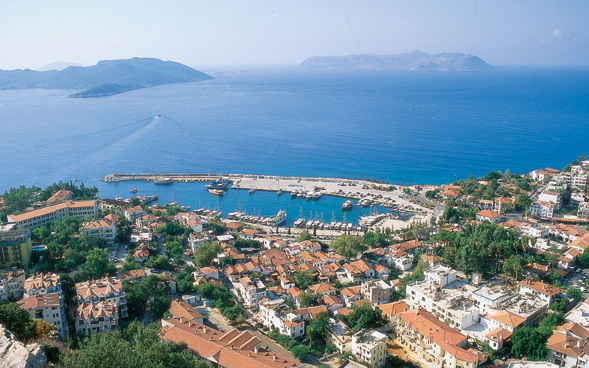 Kaş has an annual arts festival, jazz concerts in the Hellenistic theater and many different exhibitions. Kaş is one of the leading spots for scuba diving in Turkey. There are more than 15 dive centers and diving schools, mostly located at the local port. Diving in Kaş offers a beautiful array of fish and other sea creatures like octopus and sea turtles. Besides the biological diversity, Kaş offers a vast variety of underwater cultural heritage. Among various wreck sites, six artificial wrecks are worth visiting. These wrecks were submerged to create artificial reefs and touristic diving spots. Paragliding might not be for everyone, but if you have a crazy edge, Kaş is a great place to paraglide. The views are beautiful. After a 10-minute drive up the mountain, you run off the paraglide point and away you go, drifting over the town, enjoying the beautiful views before landing in the marina. The ruins of Xanthos and Patara Beach are also worth seeing. The ruins are a 10-minute walk from the bus stop and are quite impressive. They are also free to enter. The site and the river of Xanthos, which is called Letoon, have been designated a UNESCO World Heritage Site. In this respect, the site is definitely a must-see for everyone. After you finish walking around the site, you can catch the minibus back and spend the rest of the day at Patara. If you want to continue exploring ruins, the Lycian city of Patara has plenty of ruins. If you want to relax and enjoy the sea, Kaputaş Beach, around 18 kilometers west of Kaş, is one of the most beautiful beaches in the world. Kaputaş is a medium-sized beach tucked away in a mountain cove. It’s a very easy drive if you have a scooter or a car. The unique thing about Kaputaş is the stunning color of the water where the mountain fresh water meets the sea. It is quite magical. The Greek Island of Meis is just a 20-minute boat trip away, making it the perfect day trip. There are a couple of large boats leaving at 10 a.m. and returning at 3 pm. Meis is a small, pure island which provides just the perfect taste of Greece. It’s a great place to swim, eat and relax. 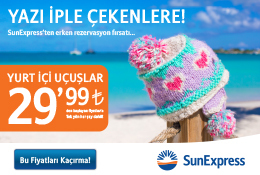 There is a booking office in Kaş town; you should book the day before. If you head to Meis, be sure to visit the Blue Cave; it is stunning.